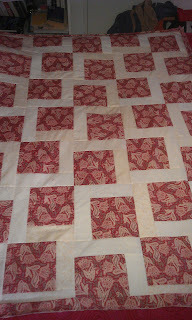 So Norwegian Red is now pieced and quilted, and I have machine stitched the binding to the front. I'm taking it to Norway at the end of the month, and will have plenty of time to hand stitch the back of the binding or the plane, the ferries, and in the car. It is going to be for my cousin Kire's 50th birthday. She lives in Kenya, so I dont know that she'll need it much though! If you have a few minuts, do visit her blog www.kiregodal.com - she is a hugely successful conservation and wildlife filmmaker, and has her work shown on the National Geographic chanel!. I'm really excited to be seeing her again: we used to meet on holiday as kids, but hardly at all as adults. She is also beautiful - seriously beautiful - and easily passes for 30, and I struggle with the knowledge that we share a set of grandparents, but she was luckier on the gene handout that I was! Sorry, didn't mean to wonder off like that. Congrats on the (mostly) finish. You'll find she might need it in 'mid winter' there, when I lived in South Africa I would swan in in linen trousers and short sleeved tops while my colleagues came in in hats, scarves and gloves lol Plus they don't have heating when the temps drop at night. It looks splendid! I'm sure that it will be appreciated. 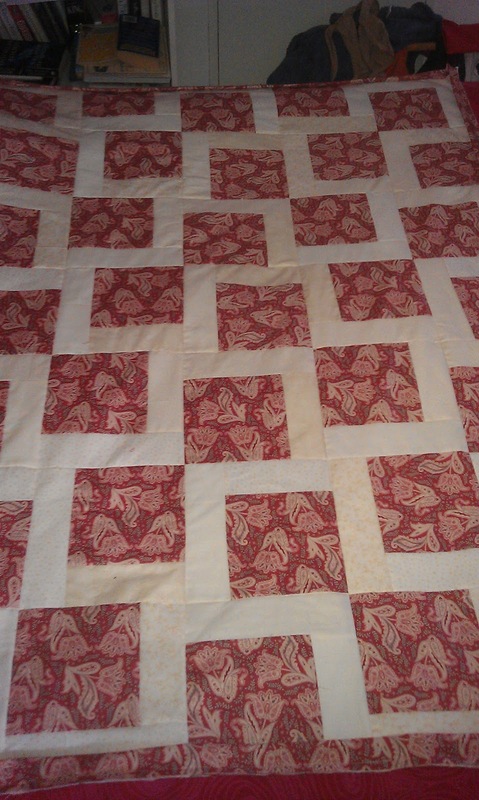 Great quilt - you can always get her to pop it over her (beautiful) head when you are with her! Well done on another beautiful production! !